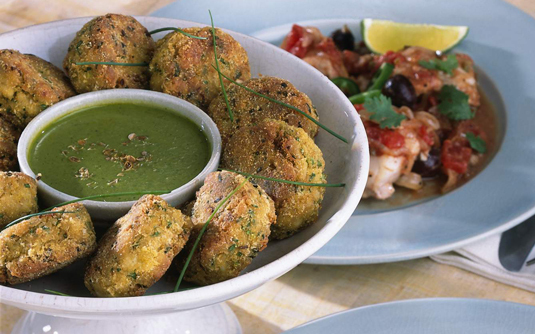 A touch of curry and a hint of cayenne make these crab cakes sparkle with flavor. With this recipe, you can make full-size or mini crab cakes, which are a bit easier to turn when cooking. The mini cakes also can be served as an appetizer for six people. Serve them with the Cilantro Sauce or with any salsa. The cakes freeze well; wrap them individually. Pick through the crabmeat and remove any cartilage. In a medium bowl combine the crabmeat and cracker crumbs. Stir in the egg, mayonnaise, scallions, parsley, salt, curry, cayenne, and pepper. Refrigerate the crab mixture for 15 to 30 minutes or until it’s firm enough to form into cakes. Meanwhile, prepare the cilantro sauce. In a blender, combine the orange juice, lemon juice, cilantro, coriander, and cumin and pulse until the cilantro is chopped. With the motor running, pour the olive oil into the blender in a steady stream and blend. Remove the sauce from the blender and set aside at room temperature; stir well before serving. Shape the crab mixture into 4 to 6 cakes. You can also shape them into 12 to 14 mini cakes, each measuring 1/2-inch wide. When you’re ready to cook, dredge or dip each cake on both sides in a little flour or cornmeal. Add the crab cakes and cook until lightly browned, carefully turning once, about 5 minutes per side for large cakes or 2 to 3 minutes per side for mini cakes. Serve with the sauce. Substitute dry English mustard for the curry powder and chopped parsley for the chives. Per serving: Calories 356 (From Fat 239); Fat 27g (Saturated 4g); Cholesterol 120mg; Sodium 595mg; Carbohydrate 8g (Dietary Fiber 1g); Protein 20g.